RONNIE HAS SOLVED OUR ALT TEXT PROBLEM! Ronnie is the best. Click the green thing under the comic to view the alt text on your phone or tablet! August’s Patron exclusive wallpapers are up! Voting for who the Patron’s Choice wallpaper for September will feature is here. We posted a the second episode of Rock Paper DEATHRAY and you can listen to it here. 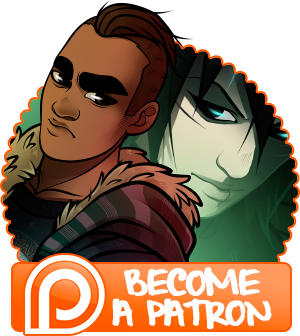 I’ve got 4 pages in chapter 15 completely coloured and you can check out previews of pieces of them here! Cory is using his Twitter again (for evil). The Valor Comic Anthology’s kickstarter is doing really well and I can’t wait to get drawing for it, and you should totally check it out! 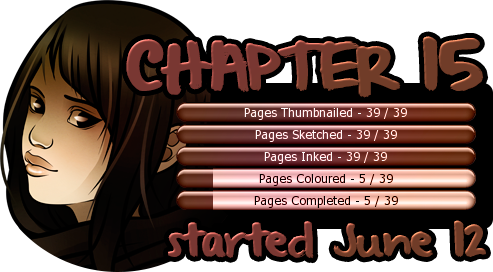 Other than that, here’s what the progress for chapter 15 looks like. This month is a busy month, but I’m hoping to get minimum 4 pages done every week, which equals another 2 weeks of buffer. I’ll probably do more. Anyhow, this chapter is wrapping up, only 3 more pages to go after this one!